Rising Moon is chomping on the bit to get to the winners circle. We have all-important confirmed distance ability as Rising Moon won going longer last year over the track. In addition we get second off layoff form with the ability to track a soft pace. This horse is well meant in a field of afterthoughts. This will be the play of the day. The town of Elmont is always complaining that Belmont is a bad neighbor. Has Elmont ever did anything for NYRA? Besides having the local residents exhaust the water pressure on Belmont stakes day, Elmont does little to nothing for it's neighbor. While Belmont contributes millions a year to the local tax base Elmont can only complain about Belmont. To further highlight the one way nature of the Elmont-Belmont relationship, NYRA has honored Elmont with its own glorious stakes race while the town of Elmont continues to besmirch NYRA. Stormy relationship aside the Elmont Stakes looks like a cut and dried affair. The residents of Elmont can rejoice in the fact that both chalks are completely dominate in every way in this race. #1 I lost My Choo drops from open graded stakes races to face New York bred restricted 3 year olds, the cutback in distance should have this one strong and stout in the lane, just like the demand for Newports and malt liquor is strong and stout in Elmont. The other filly with open stakes credentials is #7 Remarkable Remy who is third off layoff and blitzed a older field last time while pressing a very fast pace. Remy was sharp them and should be sharp today. This looks like a stout cold 1/7 exacta box. Perhaps a trifecta play of 1,7 / ALL / 1,7 may be in order as well. Not much speed in race 2 and True Resurgence has plenty. this horse seems to hate synthetic tracks and today he returns to dirt. Could be big balloons at Belmont race 2. #6 West Of Gibraltar should be able to track this pace overwhelm the pace and have plenty to hold off the deep closers. Proved that she is better than these by winning going shorter, winning on the dirt and holding on for the place going 9 panels. The German bred even money chalk benefited by a hot pace last out, think we can beat her here. Santa Anita has decided to completely overhaul it's dirt surface over the summer. Pro-Ride has been selected as the vendor to replace the inoperative Cushion Track surface which was faster than a greased slip and slide and collected water more efficiently than a swimming pool. We have no idea what this new surface will be like as it will be the first installation for this vendor in the Untied States in a racetrack enviroment. Pro-Ride had previously tinkered with the failed Cushion Track surface and made that completely inoperative surface, serviceable. With the Breeders Cup just five months away it is scheduled for a track with no surface. The big day of races hinge on a unknown surface and the pressure is on to complete the project on time. It is almost a miracle that Jose Lezcano survived the tenth race at Monmouth on the 21st of June. After his mount was checked into the rail on the far turn he lost the irons and back flipped onto the dirt head first and bounced off the ground before violently crashing back down to the dirt. His mount was unhurt and continued on without him. It was a horrendous looking incident considering which part of his body first contacted the ground combined with the amount of speed and force. As I watched the race I thought that Lezcano surely cracked open his skull, broke his back, broke his neck or was possibly killed. I was truly worried for his life and was looking forward to hearing about him walking sometime in the next year. Surely a horrific accident like this would have him out of action for months if not forever. To my surprise Lezcano walked away from the incident. Instead of recovering at home or recovering in a hospital bed he decided to ride the next day. Sometimes a bad accident will leave a jockey shaken and they will ride conservatively to avoid hurting themselves. Instead of riding safe, to my surprise Lezcano won no less than six races on Sunday. If you are able to catch the replay of the tenth race at Monmouth on the 21st of June watch it. Surviving this incident and posting six wins the next day, makes Lezcano one of the most amazing athletes in the world. All that remains between Curlin running on the turf is a turf workout in a few days. Then the next question is where will he will run? Team Curlin has their sights on both the Man O' War at Belmont and the Arlington Handicap. Both races are run on a wide turf course and not a seven furlong bullring like the one at Churchill or many other one mile tracks. 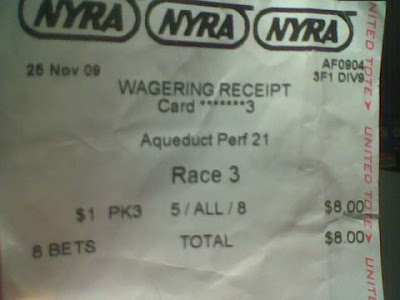 The fly in the ointment is a report that surfaced indicating that Curlin would not be able to run in New York due to licensing issues. Former stablemate Einstein was forced to run in Kentucky due to this very issue. However a new report indicates that Jackson's lawyers are confident that Curlin will be able to run in New York. Hopefully the lawyers and bureaucrats can clear up the red tape and sort out the issues. Licensing issues aside it looks like the Man O' War is the preferred race for Curlin. First the 500k purse is significantly higher that the Arlington 200k purse. Secondly the Man O' War is over the sweeping Belmont turf course which has more of a wide, sweeping international camber than the tighter Arlington turf course. Thirdly the Man O' War is a well established grade I while the Arlington Handicap is a only a grade III. Finally the Man O' War is a weight for age event while the Arlington race has weights assigned by the track handicapper. Curlin could end up giving weight to experienced graded stakes turf horses if he is Chicago bound. The Man O' War was Secretariat's first turf race, it would be fitting that Curlin begins his French raiding ambitions in a race won by the original big red. The Belmont turf course is the largest in the States and would be the closest experience to running at Longchamp. Tejida is the clear speed in a short field. Was only getting 1 lb from Mauralakana when they finished in a photo. Today Tejida gets 7 lbs and gets the benefit of the speed favoring Belmont inner turf. Keying on Tejida today at a much better price. Betting on ponies in 2008 reminds me of all the three card monte games that were played in the streets before the quality of life assault eliminated these games from street corners. Those Monte guys and their shills had a uncanny knack of hiding that lady and taking the marks money. They were fun games to watch. Today's horse racing market is not that far removed from the three card Monte games from 20 years ago. It must be funny for someone out there to watch horseplayers jumping through hoops to watch races and get a bet down. However it is not so funny if you are the mark jumping through the hoops. Just like the Monte game the mark is always one step behind. You look under one hand and expect to be able to bet Churchill on the Twinspires website but the lady is not there. You go to the NYRA website to watch replays and the NY state government restricts NYRA from showing video and replays, the lady is not there either. This is like Ikea not being able to display furniture in it's big box superstore. You have to go to some to other store (calracing) to see the Ikea goods. You live in Texas and you can bet with a ADW, you can see a lady, but you can not bet on Texas races if you live in Texas. It is like being married and not being allowed to be intimate with your spouse. It is getting increasingly more challenging to find the lady in the horse racing world. The various regulatory bodies and the tracks themselves have made mistake after mistake, taking the customer for granted, disrespecting the customer and making few attempts to attract new fans. Real discontent is growing in the horseplayer community and a backlash is underway. What can a horseplayer that truly loves the game do? We enjoy the game, it provides a diversion from the mundane responsibilities of life but on the other hand who wants to be a three card Monte mark? In New York takeout is increasing in new and punitive ways. It is like the state has introduced a new automated milking mechanism to harvest our milk more effectively and without us noticing. The state really thinks that horseplayers in New York will stand for getting less than track prices on each and every race we bet on. The NYSRWB consistently rules not for the good of the game or those that fund the game but for special interests like OTB. Rather than governing with the benevolent philosophy of growing the game and attracting new players, the current horseplayer is consistently treated like a lactating heifer fit to be milked dry. It is time to take our teats and jump the fence. Horseplayers are not trapped in a round pen. We have options and outs. We can close our accounts and leave the game we love behind, but why cut off our noses to spite our faces? Perhaps a better option is to move our money to people that want our business and will treat us and the billions we wager with respect. Off-shore wagering was something I once resisted but it is time to embrace this alternate way to enjoy the game. It is a way to liberate ourselves from a dysfunctional system while collecting beneficial rebates. It is all about helping those that help us. On top of the 1% takeout hike demanded by OTB, now OTB has legally blocked NYRA's ability to show replays on NYRA's own website. When you go to the NYRA website the quoted message below appears. People that think this game needs more centralized government regulation do not understand how government works or lack the experience of dealing with government bureaucracy. More centralized regulation empowers the government parasite to bleed racing until it dies like the powerful and corrupt New York government bleeds racing in New York. Racing needs to clean it's own house before allowing government parasites to attach themselves to the circultory system. For regulatory purposes, NYRA is not permitted at this time to provide a link to our race replays. NYRA understands and regrets this inconvenience for our fans who have come to rely upon these services. Please be assured NYRA is doing everything within its power to work with the New York State Racing and Wagering Board to restore this link to our web site as soon as possible. Horrific government corruption continues in New York. Fueled by the liberal misconception that that a large government will cure all socials ills, OTB has forced the NY government to raise NYRA takeout across the board. The government continues to grow year after year in New York like a malignant tumor. 26% takeout on pick 4's is a horrific cross to bear for horseplayers. NYRA has had some handle growth this year and NYRA was completely dominating Magna, Twin Spires tracks and Keeneland this year. Now with the takeout increasing the churn is going to drop and the NYRA handle growth will reverse to a handle dip. The total amount that the government leaches from horseplayers will dip as the handle crashes due to the increased takeout. Great win on Saturday for Curlin, he is truly the big horse in the world of racing. It is too bad the media foolishly gives the three year olds hyper attention. Big shout out to Green But Game for letting the NTRA know that they are not doing their job promoting the game. The media focuses on the wrong races, the triple crown is covered like the Olympics but great races like the Stephen Foster are totally ignored. This is the soccer equivalent of the media covering a park pick up game while the World Cup is played in the dark. Yes the media is filled with people too dim to follow something as complicated as racing but someone should take the reins in educating the media and that should be the NTRA. In a world where the media big wigs have grown up with the NFL as the main American sport, I guess the TBA is doing a better job of promoting the game than the NTRA and the TBA operates on a budget of nil. The American media is missing the real star in Curlin. He can carry weight, he can run long, he can take his racetrack anywhere, he is consistent and he can run off the layoff. Now he is looking to add the turf to his repertoire. Months ago I had a dream of Curlin running on the turf and it looks like Jess Jackson either thinks like me or reads this blog as he is mapping out a turf campaign just like I hoped for. The first target looks like the Man O' War at Belmont. A grand race won by champions such as Secretariat, Fort Marcy and Fantastic Light. Hope NYRA pulls a few strings and ensures that the NYRWB issues Midnight Cry stable a license so New York could see Curlin run in the Man O' War at beautiful Belmont Park. Bishops Back was able to win with Tyrone Carter up, that says that he has some class. Has the speed edge here and should be able to dictate/press the pace and with the win in the MSW he has a class edge too. Like the work on Sunday morning, it was fast. Play of the day at 6-1. A cold front blew through New York tonight so Wednesday at Belmont will be cooler with reduced humidity. However the track has been baked hard for 4 days under oppressive heat so I am counting on the Saturday speed bias to hold. There is over a million in the pick 6 pool, enough to free me from work so I can work on this blog more. The sequence is loaded with huge fields and challenging races, this is the kind of sequence that is going to take both luck and skill to take down. On a limited budget I will try to take this thing down. Race 4- This race includes one of my singles. #2 My Dinah goes turf to dirt after rabbit duties in the Mt Vernon setting up the winner. She should love the return to dirt and drop in class. Race 5- This race is lacking in pace but there really is nobody in the main body of the race that could take advantage of that. All In No Outs has pressed a dirt pace before and with an inside post it makes sense to take a prominent position in the running here, but I do not think this one wants the lead, but he must be used. Kick Up Your Heels is a winner at the Distance and is 3rd off layoff. Hot Table ran well last out in the common race and is the likely favorite. Dutrow sends out Youbethecan off the layoff and he is dangerous in that situation. Nikkinikkinikki was the only turf horse in the 24apr race and ran bad he is a toss. If he draws in Star For Tina should be used. Flash Of Victory would have been a single if he raced but he will be scratched. Race 6- Dancing Tin Man has proven himself to be better than these as has beaten open older claimers not once but twice. He is a single here. Race 8- This turf sprint is light on speed. Forest of dreams is a Jerkens special with the "go" blowout on Monday morning. Should be able to wire this bunch. A single in a race othesr may go deep in. There are a few articles out there saying that Belmont was a slow or a cuppy track on Saturday. The writer that wrote that is either incompetent or purposely deceiving his audience. First of all speed won every dirt race expect for the True North and the times were fast all day. Iavarone called the track a beach, it was not. My notes reflect that this was the biggest speed favoring track of the meet and I will be looking to wager on some of the closers that were comprimised by the speed bias when they run back. The water pressure issues that effected Elmont and the upper floors of the grandstand, did not effect track maintenance. The track was watered after each and every race by not one but two trucks, the drivers of the water trucks were even honking there horns at the crowd every time they drove past, so it was hard to miss them. The track is not a valid excuse for Big Brown. Race 4 was a N2X allowance over a mile in 134 and 2/5ths, not a slow time. The winner tracked a fast pace and drew off. Race 5 was the slowest race on the undercard. The statebreds went 6 1/2 panels in 117 3/5ths. 20-1 winner was close up and had back class winning a stakes race as a 2 year old. Race 6 Benny the Bull was the only deep closer that won all day on the dirt course and completed the 6 furlongs in 109 flat under 123 lbs. Not a slow time. Race 8 Three year old fillies completed the mile in 134 and 2/5ths, still fast and the winner pressed the pace. Speed was once again 1-2. Race 9 The 108 and 3 fractions of the Woody Stevens could not have happened on a beach. The winner scored wire to wire. The outclassed and overmatched speed duel loser hung on for third, perhaps the clearest illustration of the speed bias. Race 11 The Belmont was won in wire to wire fashion. Another wire to wire effort. Race 13, 116 and 4 for statebreds is a good time and speed ran 1-2 all the way around. Big Brown faded in the Belmont due to his lack of training for the race. The ride had little to nothing to due with his finishing last. There has been some criticism that Desormeaux cost Big Borwn the race, that is simply not true. It was the training that was compromised by quarter crack left him completely unprepared to tackle the test of a champion. So what should have Kent done? Instead of trying to rate Big Brown he could have tried plan b. Plan B would have been to take the very rank Brown and hook a 39-1 shot so they could duel like Smarty Jones dueled in his failed triple crown attempt. We all know how much people praise Stewy Elliot for his ride in the 2004 Belmont, but it seems like everyone wanted Desormeaux to redux Elliot's enterprising front end steal attempt. Do you really want to hook a need the lead horse in a 12 furlong race? How smart would have that been? Big Brown was so rank that it would have been a helluva duel with Da' Tara. 23 flat, 46 flat and 111 neck and neck, nip and tuck. Either way rating or dueling, Big Brown was fading on the turn and up the track, his destiny was written in stone. Brown did not have his mind or the gas in the tank to see out the trip in the Belmont. He was handled too conservatively due to his sore hoof and it showed in the performance. His lack of training and lack of activity left him with too much nervous energy and it completely took him out of his game. Nobody could have won on Big Brown in the Belmont. The Breeders Cup will return to network TV this year. ABC will air 2 1/2 hours of the Saturday program from Santa Anita. The last two years have been on ESPN and ratings have dropped 53%. The wheels fell off the Big Brown express today. As good as he looked in the Derby and Preakness Big Brown was just plain terrible today. Fractious in the detention barn, nervous in the paddock, rank in the early part of the race, he did not run his race today. The boastful Dutrow who dared the racing gods, received his punishment for his gross arrogance. When confidence grows into arrogance the punishment is usually swift and stout and Dutrow's arrogance was punished today. . Dutrow provided great theater with his antics and no doubt Dutrow's antics made his loss was very satisfying to many people. Before there Derby we wrote these words. Usually one can get away with this attitude for only so long before the game gives out a maximum dose of bad racing luck. Try going to the track with this attitude and making wagers, talk about a humbling experience. This type of talk is very polarizing, I see that Big Brown can go one of two ways. He is either going to run a fricken' hole in the wind and drop jaws or the horse is going to be up the track. If this horse does not win, he will not hit the board in the Kentucky Derby. Big Brown's performance is going to be something extraordinary or something commonly dull. When this horse gets beat it is going to be ugly. The Japanese horsemen have a different training methods than their American counterparts. While the Americans use fast workouts combined with drugs to train their horses, the Japanese use a more holistic approach. Instead of a steady worktab of bullet works for Casino Drive, he is a power walker, taking vigorous one-hour strolls through the barn area. He then goes to the track for an easy jog before resuming another hour of walking. "We really try to pick his feet up," said Nobutaka Tada, spokesman for owner Hidetoshi Yamamoto and trainer Kazuo Fujisawa. "We want him to be ready, so he will be strong." Not only do the Japanese train to be long and strong but they do not use drugs, hormones or chemicals to artificially enhance growth or performance. It is an entirely natural approach. Take a look at these Japanese training centers. They seem like racehorse utopia. The Japanese not only want to make fast horses they want to produce an exceptional individual. The JRA provides facilities to nourish the entire horse, both physically and mentally. It is no wonder that they do not need to drug their racehorses with this approach. Their philosophy seems superior to the American training philosophy of work them fast, drug them if they hurt and retire them early if we are lucky. Perhaps if our training centers had uphill woodchip trails and wilderness trails passing through streams we would have relaxed, sound horses that would not need a variety of medications to compete. Knowing how difficult it is to win a graded stakes on the dirt going long off the layoff I was impressed when Casino Drive emerged off the freighter ready to romp in the Peter Pan. One look at the Japanese training methods and I understand why he was ready. They had a press conference today in Times Square for the Belmont Stakes. The connections of only two horses bothered to show up. Those two horses were Big Brown and Macho Again. Where was everyone else? Not very classy of the connections to disrespect a classic race. Must be challenging to conduct a press conference if the principals do not show up. While Big Brown may not have scared away all comers for the Belmont, only one other horse was represented at the press conference. The temperatures are starting to heat up here in New York. After a nice cool May the temps are finally increasing into the 80's. Belmont day may flirt with 90 degrees and it will likely be humid. Rain is not forecast for Saturday but there is some unsettled weather looming off to the west that will bring showers on Wednesday and Thursday. Hopefully the weather moves through and it is a nice clear day with a fast track. Big Brown worked 1:00 flat this morning at Belmont in preparation for the Belmont stakes. Word is everything looks good and he is on schedule for for his date with destiny on Saturday. Commenter Rufus Youngblood came back with a fair rebuttal to the Dutrow/Iavarone post and would like to expand on the topic. Mr. Youngblood made many cogent points which I agree with and I think he is on-point regarding IEAH. Hopefully they will do the right thing and have Brown race a few more times and get in the gate for a mega race with Curlin. However I think the barrage of articles, internet blogs and comments about Dutrow and Iavarone completely miss the point and are more of a expression of jealousy and envy than well thought out criticism of what Big Brown means to the sport. If these people wanted to bash Dutrow and Iavarone they should have had the substance to consider the present and the future in their attacks. The Bloomberg article was a strait up smear piece and the anonymous commenter-cockroach that dug up and made up a bunch of stuff about Dutrow was even worse. Digging up some dirt from the early 1980's and 1990's ignores the pertinent issues and frankly shows the bashers to be envious, hateful, close-minded people. Bashing Dutrow because of his brashness shows that the bashers are close-minded, inexperienced and square. The real way charactor is measured is in how treats his horses, how he treats his family and his staff. Those that think Dutrow is rude and uncouth are missing that he is good for the game with his big mouth, a real headline maker in a game desperate for headlines. If these bashers could focus on how Big Brown is going to be retired and cashed out like a savings bond, their bashing might be something I could get behind. At this point it smacks of jealousy, envy and shallow social experience. I can not get behind this bandwagon to nowhere. They can keep the character assassination, perhaps a more educated mode of attack, one that focuses on how IEAH is going to crap all over the game, is something I could agree with a bit more. With all of Big Brown's hoof issues why not look for a kinder surface and run the colt on the turf after the Belmont? Not only could this be good for his hoof but it could round out his limited resume. Iavarone and Dutrow could take on older in the Arlington Million, this would be a thrilling win in a race known all around the world, not some huge drop in class cop out. For the breeding angle a Arlington Million win would give him appeal to the European breeders. Instead of shipping to hot and hard California for the Poly/Cushion/Polymer Classic he could contest the Canadian International, just like Secretariat. $2 million purse and a field of world class turf horses. If the Big B wins the triple crown he has proven that he can beat the dirt three year olds of his generation. To continue to run in races like the Travers belabors the point and degrades the hooves. Considering his limited career it is important that the brash Dutrow plans out a campaign that will round out Big Browns resume. His record could use a stakes turf win if he wants to be considered great. Secretariat took to the turf and so did the great Dr Fager. Team Big Brown should use some of that confidence and braggadocio from the recent press conferences and take this horse back to where he started on the lawn. A horse with a limited resume needs to have quality and variety on his resume if he wants to be considered great. After the late Summer/Fall turf campaign a showdown with Curlin would blow the lid off the Big Brown hype machine. NYRA could arrange a special race at the end of the year for Big Brown, Curlin and others. We are talking about a huge purse $3 million or more. Not only would this be a major racing event, but it would be a major media and sporting event. The profiles of all the horses would be raised by running in this race win or lose. There is the potential for the race of the decade if big talking Dutrow and Iavarone are game enough to take on Curlin. This is what the sport needs. It would be a huge event, something beyond the Breeders Cup. The purse could be sponsored by UPS and it could be televised all around the world. Tomcito has been declared out of the Belmont by his connections. According to trainer Dante Zanelli. Zanelli said the son of Street Cry was suffering from a “reaction” but did not specify what caused it. “It’s very depressing,” he said. Maybe they should find an allowance race for Tomcito so he can get a win over here in the states. Looking at his stride he does not look like the a stakes horse in the US. They need to find an easier spot. Get the Thoroughbred Bloggers Alliance Standings widget and many other great free widgets at Widgetbox! Power Cap is now a group endeavor. Joe Burns has signed on and increased the Power Cap team by 100%. He has been a racing fan since childhood and even managed to sneak some horse racing into his High School paper when he wrote there.